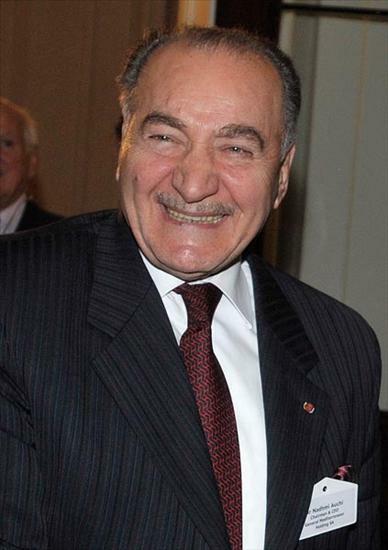 Sir Nadhmi Shakir Auchi is a wealthy British-Iraqi businessman, born on 11th June 1937 in Baghdad, Iraq. He is best known as the founder of the Anglo-Arab Organization as well as the founder and chairman of General Mediterranean Holding, which consists of 120 companies worldwide. Have you ever wondered how rich Nadhmi Auchi is? According to sources it has been estimated that Nadhmi Auchi’s overall net worth is now $2.3 billion. This impressive wealth originates from Auchi’s entrepreneurial spirit which has led to the establishment of one worldwide conglomerate and one international organization. Nadhmi also owns numerous office buildings and hotels in America, UK and France and has interests in pharmaceutical and financial industries, which enormously increases his net worth. Auchi’s wealth increased by $700 million in just one year, thanks to his companies outstanding success in business during 2012. Born into a professional family in Baghdad, Auchi started his education by going to “Al Mansoor Primary School” and later to “Baghdad College” high school. He then enrolled Baghdad’s “Al-Mustansiriyah” University and graduated with a degree in economics and political science in 1967. Only two years after graduation, Auchi started working with the Iraqi Ministry of Oil, and became the director of planning and development. His career was going upward very quickly, so that by 1979 he was already the founder of General Mediterranean Holding in Luxembourg. However, following a blackmail attempt by a certain assassin, Nadhmi and his family decided to move to London, although Auchi and his family didn’t become British citizens until 1989. Obviously his net worth was rising quickly too. It was only six years later that Auchi’s brother was hanged, following conviction for alleged corruption. Since that event, Auchi and his wife promote inter-faith dialogue, unity and humanitarian work, for which Nadhmi is very well-known. Other than being an excellent businessman, Nadhmi had a voice in politics, education and humanitarian work as well. He was the vice-chair of the Kennedy School of Government at Harvard University from 1996 to 2000. In 1996, he was declared Officer of the Order of the Republic and was awarded the Grand Cordon of the Order of Independence from Jordan four years later. He also became the president of the Anglo-Arab Organization in 2002, a non-profit making organization which was founded in order to promote the integration of British Arabs into British community, while still retaining their identity. The AAO’s humanitarian work is broad, and includes money donations to homeless families in Pakistan, building schools in Morocco and collecting a sum of $ 35 000 for Cancer Research Unit of the Kingston Hospital in London. Being an educated man himself, sir Auchi decided to launch the “Nadhmi Auchi Fellowship For Young Arab Leaders”, an association dedicated to students from Egypt and other Arab states, which pays for all of their study costs. Nadhmi received another acknowledgement in 2013, being awarded the Freedom of the City of London, and only a year later he was named a Knight Commander of the Most Distinguished Order of the Nation of Antigua and Barbuda. However, in spite of his incredibly successful business career, certain dark sides were revealed when, in 2003, Nadhmi was convicted of fraud and corruption related to the “Elf Aquitaine” oil company. His punishment was a $2.8 million and 15 months of suspended jail sentence for his involvement in the 1991 scandal, when he was accused of illegally usurping $ 118 million. When it comes to his personal life, Auchi married his wife Ibtisam in 1963, and they have three daughters and a son.